Recorded at Longboat Hall (Camp Wavelength – Night 3), August 20, 2017. Since 2009, the summer Wavelength festival has been a highlight of the season, slowing down the hectic "festival experience" to an Island pace and making the whole thing as much about the vibe and the location as the (always well-curated) music. When this spring's floods shut the Island down, there was a ripple of apprehension from many quarters at the loss of favourite summer hangs, culminating in the festival decamping to the mainland. The WL crew did an excellent job in emulating the festival experience in the outdoor/daytime portion, but it was harder to feel the same sense of relaxation and freedom in a bar. I've always considered myself to be a casual fan of San Francisco's long-running Deerhoof. (It turns out I have four of their albums when I just checked, though that's a pretty slim slice of their full output.) Relying on their recorded work, especially relatively-recent albums like La Isla Bonita and The Magic I'd always thought of them as a quirky pop band, not realizing that their live show has a reputation (earned, it turns out) as a shred-fest. Performing as a guitar/bass/drums quartet with none of the elaboration found on their albums, the band cranked out song after song with plenty guitar heroics from Ed Rodríguez. They'd occasionally pause to catch their breath — a chance for drummer Greg Saunier to amble over to the mic to share some abstract observations with the crowd, or for vocalist Satomi Matsuzaki to demonstrate the principles behind the imminent solar eclipse — before diving back in. 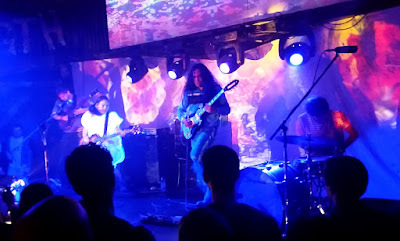 With this show coming on the cusp of their latest effort, they seemed comfortable to wander through their back catalogue, which was defintely a crowd-pleasing move. Big name out-of-town headliners can feel a bit discontinuous from the general vibe of a Wavelength festival, but hopefully it serves to pull in folks who are looking for some more adventurous musical journeys and might return for something cool and homegrown.